Some children are naturally drawn to the pictures of a book especially is they are smart and convey something important. That's this book. Carefully tucked into each page are pieces of the body of a very black spider. This is her world and her web. This is the place where she lives. Sharp eyes will discover the bits of spider hidden here and there. Those same eyes will devour the array of butterflies here and leaves there. These are puzzle pieces gorgeously delivered with delicate detail. The natural world of the spider is ours to savor. There's a sense of mystery here and a sense of fun. Turn the pages and gather the bits and pieces and you'll begin to see how it all fits together in the most masterful and miraculous way.... a web that is large enough to hold you and me. 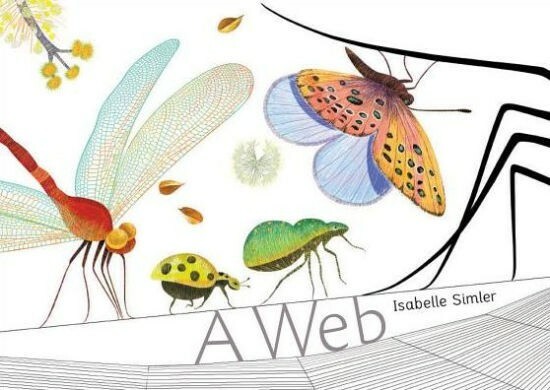 ********* From New York Times Best Illustrated Children's Book artist Isabelle Simler, a picture book (and nature guide!) to linger over. In nature, there is much to see. Look closely as a spider -- both a collector and an artist -- skillfully crafts a masterpiece from all that falls into her path. Patient and observant, she appreciates all the wonders that make up her landscape -- from ferns and feathers to bugs and butterflies. Readers will come back again and again to the luscious and intricate illustrations, soaking up all of Simler's delicate details. Picture book measures 13'' wide x 9'' high.